Three of our Gamemasters have had to cancel their events. We have a lot of games on the schedule for this month; it would be great if we could see enough players turning up to fill them. And we hate seeing a lot of blank spaces on the sign-up sheets. We'd like to encourage people to sign up for games ahead of time using our online registration page or by sending us an email at game-a-thon[at]swa-gaming.org. As a special incentive all the people who sign up (and GMs) will have their names entered into a drawing for a door prize ($10-15 value; one winner per 25 people per session; must be present to win; registration deadline of 6pm on 11/10). We are very sorry to announce that the SWA has lost another one of it's Planning Team Officers, Michael L. Rogozinski. Mike was involved with the SWA for many years, both as a GM and Council volunteer. Many of you, especially you war gamers, have probably shared a gaming table with him. 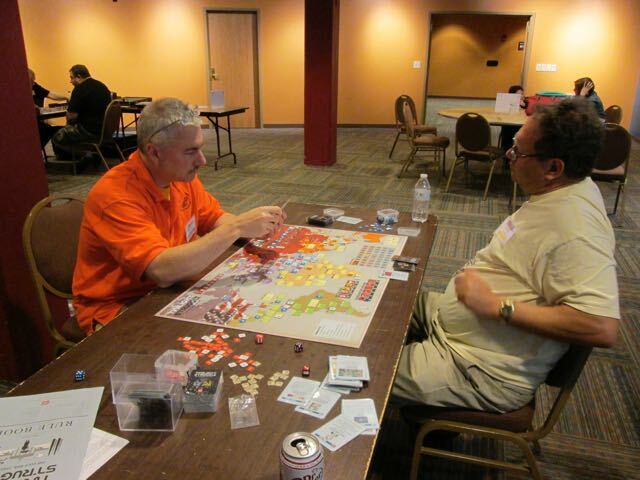 Here's a photo of him at a recent Council playing Twilight Struggle (he's the on one the left in the orange Staff shirt). 3040 Hamburg Street, Schenectady NY. Mike was only 54 years old. This is two SWA members in their 50s that we've lost in the past year. Council Registration is now CLOSED! Online registration has closed. Now we'll get to work stuffing envelopes with badges and tickets for the folks who registered in advance. For those who didn't, we still have plenty of spots left in events. Come to the Registration Desk at the convention to register and buy tickets during the con.